Python web development services, provided by Quintagroup include full-cycle web development, deployment and customization, support and integration packages. 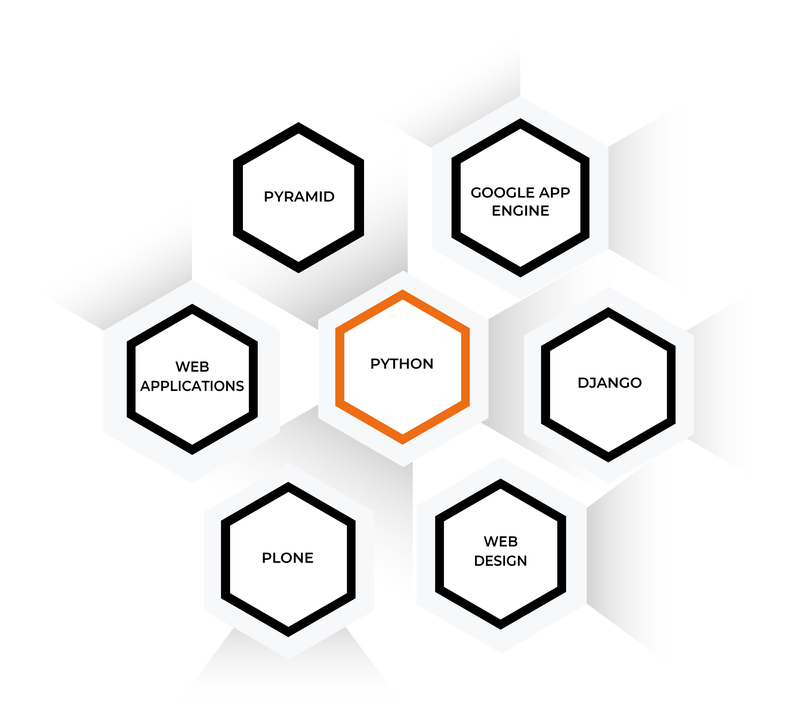 We utilize Python web Frameworks like Pyramid, Django, TurboGears, Zope to build high-quality, reliable web applications. You are a business trying to compete in an ever demanding market? Whether you are a start-up wanting to make a splash on the web, or a large business desiring prime Python web development services, we are here to help. Pyramid is a structured and extremely flexible Python web application framework, built to ensure high performance speed and reliability. The web framework boasts a substantial collection of additional packages. They include an XML-RPC package, an email system, a session and caching modules, and more. Minimum complexity with maximum efficiency together comprise the essence of Pyramid web applications. Zope web framework is widely used for Content management system development, including Plone. Django is a high-level Python open source web framework, initially designed to meet the requirements of web masters that work with large-scale data-driven web applications. Django has gained good reputation for its high-speed performance and elegance. TurboGears is a megaframework, built upon a collection of tools, including the SQLObject, the Cherrypy framework, the Kid templating system and the MochiKit AJAX library. With us your company will get the power, flexibility and all the benefits of a custom web service - fully tailored to your specific business needs. We specialize in developing top quality, reliable and cost-effective Python applications of any complexity, from small web-based solutions to large complex systems. Leveraging our deep experience of implementing web solutions around the world, we can ensure that any web application will perform smoothly and quickly in your specific environment. Our web support services cover everything from your website maintenance and hosting, seamless integration, outstanding technical support on all related issues to marketing advice that will drive your business. Whether it is a corporate website for your business, an intranet solution for employees or an extranet for your partners and clients, we provide you with a powerful and user-friendly system to communicate over the Web. Our company provides end-to-end e-Commerce solutions that deliver clear benefits for our clients. Our project team is well-versed in all aspects of Python web development. We combine innovative ideas and state-of-the-art web technologies to give your business an edge over the competition. If you are looking for Python developers for any type of web development project, we would be happy to channel our solid business domain experience and technical expertise into working with you. Please contact us today to request a quote and learn more about our Python web development services.